Charge your electronics withour plugging them in!!! While you can’t do it today, you soon will be able to.Â Heck if Nikola TeslaÂ had his way, we could have a LONG time ago.Â Â Â Check out CNN’s Article. Star Trek Experience Closing September 1st! Â Â According to the Hilton, the space will remain vacant through New Year’s Eve with no concrete plans to date as to what will take its place. The rumor mill is speculating that it will be…Â Â Â wait for it…Â Â a Michael Jackson stage show (you may express your outraged gasps and expletives now). I however am betting (pun intended) that in an ever increasing economic downturn coupled with casinos which have surpassed their own surprising depths of greed that it will simply become even more gaming space (as was recently done to the beautiful Fountain Room cocktail lounge at the Bellagio with its gorgeous floor-to-ceiling windows overlooking its world-famous namesake which now go unappreciated). Â Â But all may not be lost dear friends. Cedar Point concedes that in the wake of the announcement of the closure the outpouring of fans asking for the Experience to remain open has led Cedar Point to consider at least merely moving to a different location, though likely not in Las Vegas. So who knows, maybe just like a low-budget 60’s tv show, the Experience may yet be reborn again someday, somewhere else. 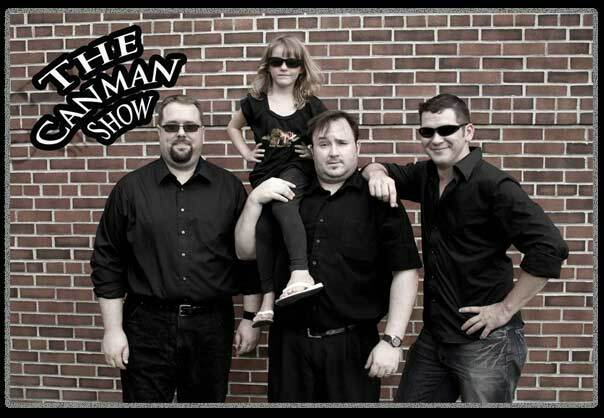 First Photo of The Canman Show cast. Don’t Forget! Gypsy opens tonight! Make sure you go check out Theatre Cedar Rapids Production of Gypsy this weekend.Â Â It opens tonight at McKinley Middle School! Exciting plans are in progress for Jim McDonough’s “Holiday Grande 2008” to be performed on three weekends, from November 29 through December 14. For the past five years, we have been thrilling audiences with beautiful Christmas music, making this event a holiday tradition for thousands of families. This year is no exception, as we take this stage production to some of the most beautiful venues in Iowa, on our five city tour. Allen Koepke, musical director, will be conducting our 15 piece orchestra, featuring “Iowa’s Own Pianist” and recording artist, Jim McDonough. The cast of musicians would not be complete without very talented singers and dancers, choreographed by Michelle Philgreen. Please come to auditions in dance attire, and have a song ready to perform. Auditions will be scheduled by appointment, by calling 319-360-4892 (Cedar Rapids). We are planning to employ eight or ten singer/dancers, with a high energy level, who will perform well in an ensemble. Costumes and staging will be very elegant. In the past, many of our performances have been sold out, as we have a large number of groups who travel from surrounding cities and states by motor coach. We are very pleased to present these concerts to benefit Camp Courageous of Iowa. To schedule an appointment for an audition, or if you have any questions regarding the auditions and concert tour, please call 319-360-4892. We’re looking forward to seeing you at the auditions! Make sure you go see Theatre Cedar Rapid’s production of Gypsy.Â It opens this Friday night. Watch as a star isÂ born! Auditions are coming soon for Lillian Hellman’s classic drama The Children’s Hour, directed by Leslie Charipar! Auditions for female youths who can play age 12-14 are Saturday, Aug. 23 at 1 p.m. Adult auditions are at 7 p.m. Sunday and Monday, Aug. 24 and 25. Auditions will take place at the Grant Wood House (formerly Cedar Memorial Grant Wood Chapel) at 800 2nd Ave. SE.Â Roles includeÂ 2 adult men,Â 5 adult women andÂ 7 girls ages 12-14. In The Children’s Hour, the careers of two teachers are threatened after a student at their all-girl boarding school begins spreading rumors about them. The play contains adult content. It will be performed at the Grant Wood House Sept. 26-Oct. 5. Scripts are available for 3-day checkout on a first-come first-serve basis at our box office in the Grant Wood House. For more information, call 366-8591. MOvMNT Dance Company will be holding auditions for it’s 12 & Up Dance Company under the Artistic direction of Lovar Davis Kidd. Come and be a part of this HOT Dance Company! Sunday August 24th & September 7th, 2008.Â Â Auditions will be held at Art In Motion Dance Academy located at 123 Marion Blvd. in the Indian Creek Mall behind McDonalds. Dancers must be trained in at least one of the following disciplines; Hip Hop, Tap, Break Dancing, Jazz, Modern, or Ballet. Must be at least 12 years of age or older by September 1st, 2008.